Definition at line 97 of file NNFJN2Plain.hh. returns the dij_min and indices iA, iB, for the corresponding jets. Definition at line 232 of file NNFJN2Plain.hh. 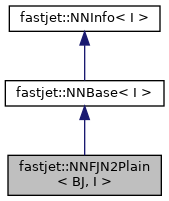 merges the jets pointed to by indices A and B and replace them with jet, assigning it an index jet_index. Definition at line 279 of file NNFJN2Plain.hh.